Well, I'm something like 19 chapters in so let's just go with a shorter version, but I'll post new updates in full when I have them. Now, this isn't your usual legacy. Because honestly, I don't care for rules. I don't know if I'll ever even make it out of the "first" generation because I'm hopelessly attached. Also I'm already actually on the 5th generation, I just kind of didn't really take the family too seriously before and only just started posting with this generation on my Weebly site. So it's not your starting from nothing legacy (anymore). It's really just me playing through the generations until I get bored. Anyway, if that didn't put you off and you're still here. Let's meet the lovely Evie Ellison, the "founder". Music, specifically singing, has been Evie's passion ever since she was a young child. Someday she'd be a star, alongside her best friend Julianne. They'd singing together on the karaoke machine all the time and even at a young age they sounded amazing, individually and together. 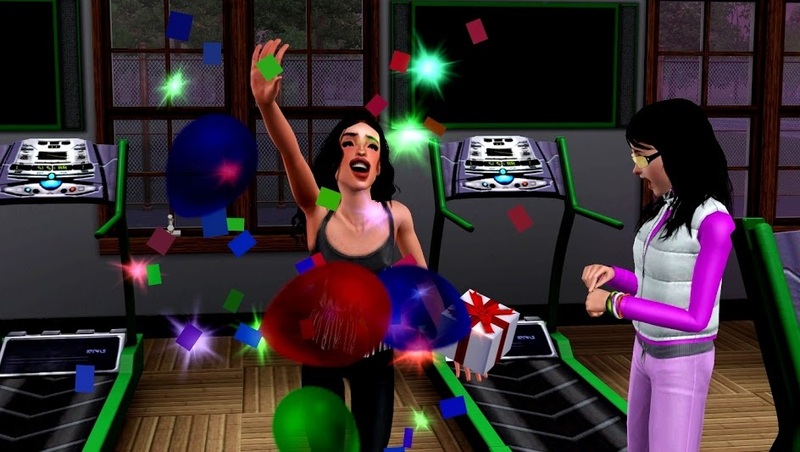 In her teens Evie started singing to the public, in the humiliating fashion of having to sing some weird congratulatory song to somebody for completing a workout, or some such nonsense (the things people make a big deal out of). It was definitely not her dream, but she knew she had to keep at it to achieve her dream. So she did and soon she was getting gigs to perform at coffee shops. Even scoring a weekly gig at the karaoke bar. Thankfully, her parents were extremely supportive and patient because it meant breaking curfew and then staying up all night to do homework, constantly. Through it all her family supported her every performance. And so did Julianne, though they weren't finding this success together. Of course, one day, around the holidays, Julianne revealed her real feelings towards Evie, under the mistletoe. Or she tried to. But at that point, music was the only love in Evie's life. She'd never really considered dating, she didn't even know if she liked girls or guys. Though, she thought after that moment, and eventually came to the conclusion that it was both. And there was a small part of her once she figured things out, that wondered what it would have been like with Julianne. But it didn't matter because by that point, Julianne had moved on to Evie's twin sister, Mae. A bit of a surprise for Evie one day when she was playing piano to look up and find them making out. But while it was uphill for Julianne and Mae, it was downhill for Evie and Julianne. Julianne started to pull away and act weird around Evie, until eventually she just blew up. And that was it. Evie had no idea what really happened, but she suspected jealousy (by this point Evie was starting to play some of the bigger venues in town and Julianne was lagging behind). After that they *barely* acted civil towards each other for Mae's sake. But Evie found a new best friend, Jules MacDuff, who took on the task of numbing the pain of losing her very best friend. And experienced a bit of rejection herself, after she developed a crush on Jules (they were ALWAYS together and it just built up over time) only to learn... he liked her brother Nolan and Nolan liked Jules. It was a short-lived relationship, but Evie and Jules grew apart. At least she stayed pretty close to Nolan. And Mae. Sometimes. 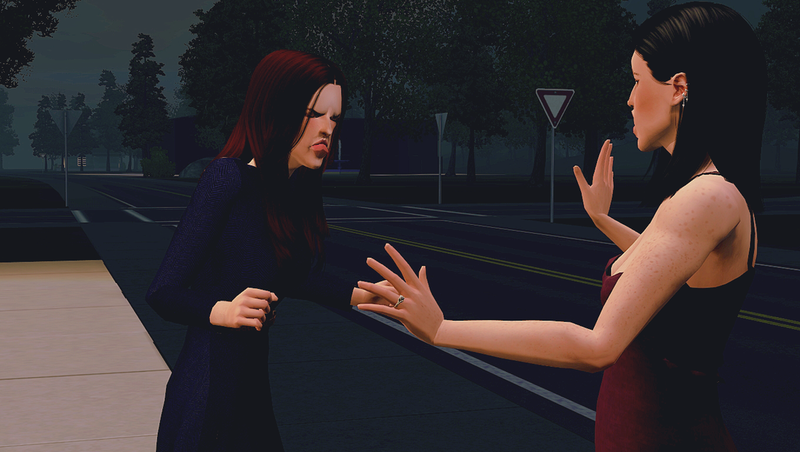 Mae is a bit of hot-head however and is always picking fights (oddly, Evie is the one with the trait and never shows it. Mae is the opposite) so they've had quite the rocky relationship. Sometimes they're best friends, sometimes they're each other's biggest enemy. But her siblings were always her best friends (even her younger sister Delia, though they weren't as close, largely due to a bigger age difference and being at different points in their lives), no matter else who came and went. And Evie's music was really starting to take off, she'd booked a world tour for after she graduated high school (she was valedictorian, by the way. Such an overachiever). She took an extended stop in Monte Vista to spend time with family. It was where she'd been born, before moving to Moonlight Falls when she was a young child, and her grandfather and a couple aunts and uncles still lived there. And fate aligned. Her grandpa's house, where she stayed, was behind the pizzeria. Where she went for an after concert meal. Also getting an after concert meal, starstruck and awkward Alex who probably regretted just blurting out too enthusiastically "You're Evie!". But only for a brief moment and for a brief moment Evie regretted it too, but once she looked up, that was it. She couldn't be annoyed at that cute face. While waiting for their food, Evie and Alex chatted and the pizza she probably would have take home to eat she took to a table so they could keep talking. For hours. Until the wee hours of the morning, not much before the sun came up. Alex, more out of not wanting to part ways, but still a gentleman, walked Evie home. The long way, because they could have just gone out the back door and been there in 3 seconds. But they walked all the way around the block, slowly. And shared a goodnight kiss at the door. And the next day (or later the same day, technically) Evie invited Alex and his family to join her family for a barbeque they were having. 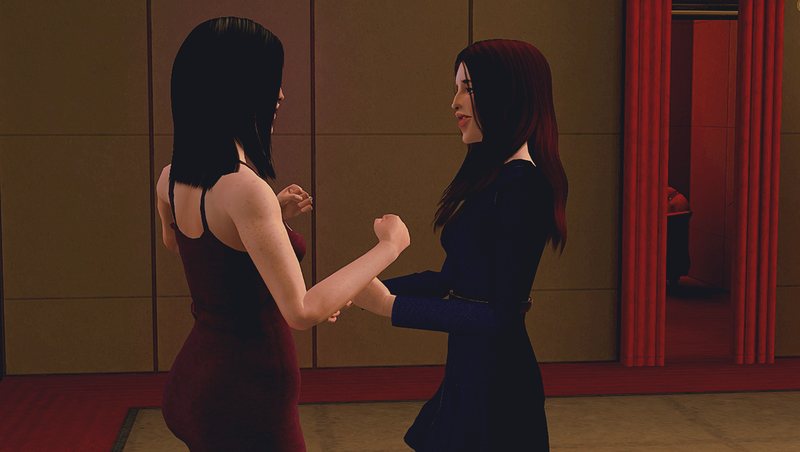 Evie's parents and siblings had joined her on her Monte Vista stop, so while she really only wanted to invite Alex only, she thought maybe it would be more casual and her parents (mainly her dad) would be easier on Alex. Well, Evie's dad and Alex bonded pretty quickly though, as they shared a love of sports. Both were athletes, Evie's dad a professional soccer player and Alex a PE student and aspiring hockey player. So while the guys chatted and kicked around a ball, Evie took to chatting with Alex's sister Katie. The girl who would become her new best friend. And as the day wore on and everybody else started heading home, leaving Evie and Alex alone together. Evie had to continue on her way the next day and Alex would be going back to school very soon. So they stayed out all night savouring every moment they had, talking and watching the sun set. Evie promised that she'd visit Alex at school every chance she got and they'd talk on the phone all the time. Promises that were never broken. Months passed and the winter holidays had arrived. Alex would stay with Evie in her new house (all on her own) for the break. They basically never left each other's side during those couple weeks. Whether Evie was showing Alex all the fun things around town, like the winter festival. Or they were snuggled up at home by a fire. And Christmas Day after Evie's family arrived for dinner at her house and all the presents were gone from under the tree, or so Evie thought. Alex pulled out a tiny little box that he'd managed to hide up in the branches. And after a few short but amazing months together, they got engaged. A week later they announced that they were expecting a baby. Something they hadn't planned and had been careful to avoid (fate just had different plans) but were excited for anyway. January came and Alex had to go back to school yet again, leaving Evie alone, pregnant and emotional. It had been hard being long distance before, but it was suddenly a lot harder. By this time her tour had wrapped so she spent much of her time sulking around the house. Pretty much only the pull of wedding dress shopping could lure her out and cheer her up. And it wasn't even for her wedding dress, but Mae's as she'd gotten engaged to Julianne a few months back and the wedding was rapidly approaching. Of course, it didn't hurt for Evie to look either (especially since she found her dress). Aw, they look so happy there, don't they? Everything was just so perfect in that moment. But it wouldn't be for long. February Alex came to visit Evie for a couple days for her 18th birthday and for a late Valentine's celebration. They had a nice picnic in the park, their favourite date activity. But Evie also had plans with Mae that night to celebrate their birthday together. So as much as Evie could have happily stayed snuggled up with Alex in the park all night, they had to go home. And that's when they found Mae waiting at Evie's door and crying. Julianne had dumped her, on her birthday, and a week from their wedding. Of course, Evie wasn't going to let Mae's birthday be ruined. So it was right off to the club where Mae tried, fairly successfully, to drink the pain away for a bit. And the girls had a nice time on the dance floor. Until Evie noticed Julianne. 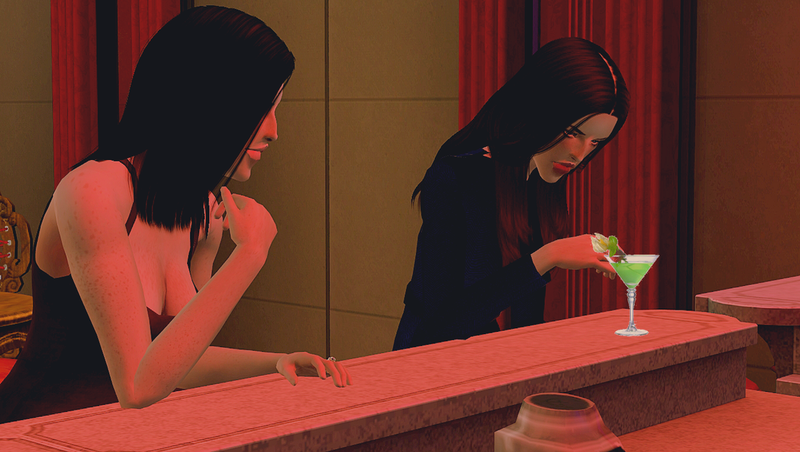 Mae hadn't noticed her yet and with any luck she never would so Evie sent Mae to get some food and went over to give Julianne a piece of her mind. And maybe a solid slap across the face (though she knew she had to resist that urge, no matter how strong). But Evie was left speechless with the confession that Julianne loved her. Still, she still wasn't over whatever feelings she'd had before. Evie was, of course (because she was so madly in love with Alex), completely over any small interest or curiosity she'd ever had about Julianne. But it was quite the confession and something Mae could never know. If only Mae hadn't snuck up behind them at the worst possible time. Before either Evie or Julianne had a chance to say anything, Mae had run out of the building. Evie went running after her, sometimes it was best to just let Mae be upset and keep some distance from her, but she was drunk and Evie wanted to make sure she was safe. Though, it was a struggle as Mae wanted nothing to do with Evie. But Evie persisted until she had Mae in her car. She'd take Mae home with her, so they could sort things out in the morning. Only, when morning came, Mae was gone. 2 weeks later Mae still wasn't talking to Evie. Which was beginning to hurt a bit, especially since the day had come for Evie and Alex (who had flown in for the occasion) to find out the gender of their baby. And Evie had promised that Mae would be the first to know, she really wanted Mae to be first to know. And she did her best to keep her end of the promise and left Mae a message with the news (It was a boy!) though she figured Mae would probably delete it without listening, but at least she tried. It was when Evie called her parents and her other siblings that she learned Mae had run away from home too, even if they hadn't been talking Evie had at least known that Mae was safe somewhere. But now... she had to find Mae. And she started with the last place she really wanted to go at that moment, the house Mae and Julianne were planning to move into together. She had no idea, since she hadn't talked to either, who would get the house. And she really, really, didn't want to see Julianne on the other side of that door. But that's who it was. Very intriguing story - Evie is in a quite complicated situation! I love the wedding dress shopping picture, the girls look so happy and lovely.